United Capital is a fast growing financial planning firm with offices throughout the country. They came to LCP looking for a way to deliver printed business and marketing collateral to any office and maintain the brand standards that were being developed and eliminate the need for designing. After meeting with the team from United Capital and their agency partner, a plan was put together that would address the need but more importantly give the organization a platform which would allow for their planned growth. UnitedCPstore.com was launched at the end of 2011 and serviced 29 office locations. As anticipated, United Capital regularly have added additional office locations and today there are 74 office locations serviced by the site. The store administration is handled by the team at LCP in cooperation with the United Capital corporate offices in Newport Beach CA. As the company has grown and continues to add new locations, the site has also grown. Today UnitedCPstore.com is more than a print on demand site. Today the store houses inventory managed collateral, variable data documents, office supplies, premium and promotion items, ad templates, editable power point decks and new hire on-boarding kits all of which are fulfilled daily. United Capital has been able to agressively grow their organization and provide maketing support to new offices from the first day they join the company. The site has also been used as a tool for recruiting new offices into the United Capital team. Having an organized, complete and user-friendly tool full of relevant and current content has been key in attracting and aquireing new locations. 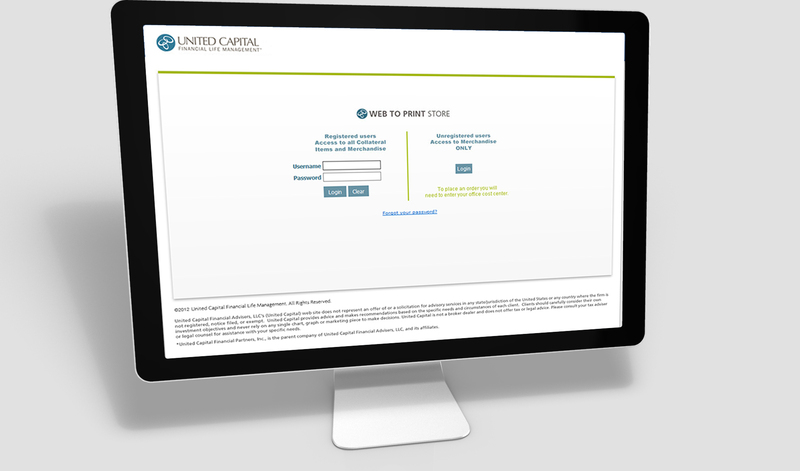 The login page for United Capital provides authenticated access for collateral material and category access as well as a open login option for purchasing premium and promotional items. After the user enters their credentials the available categories based on their user rights are displayed. Within each category the user is presented with a variety of products to order from inventory, print on demand or customize through a variable data web form. Customization varies by product and the specific needs of the piece. Users can choose images, edit text, choose from pre-populated lists and even upload complete pdfs for one off production projects. Once customization is complete, the user is presented with a real-time proof to view and approve prior to submitting the collateral to their shopping cart. When the user is finished shopping and ready to check out, the functional shopping cart enables the user to review their order content, adjust quantities and provide shipping instructions for the order. Completion initiates email notifications.